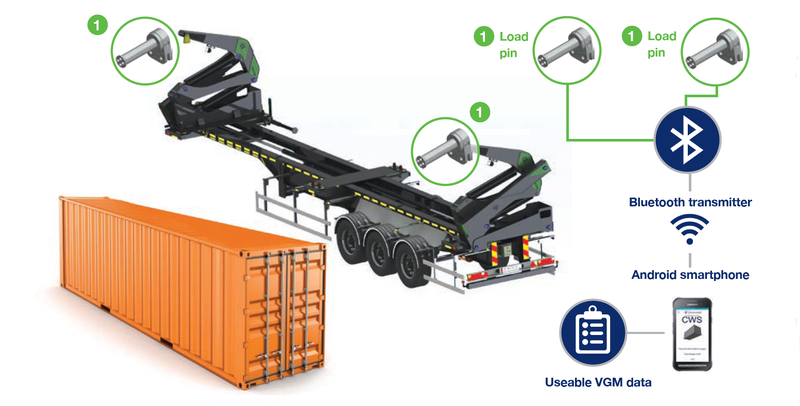 Strainstall’s Container Weighing System (CWS)™ sidelifter configuration enables road hauliers to determine a verified gross mass (VGM) during standard lifting operations. The CWS™ sidelifter configuration has been designed to make it easy for road hauliers to produce a verified gross mass (VGM) certificate in the course of standard loading and haulage operations. The CWS™ sidelifter solution utilises a pair of load cells in place of the original pins in the sidelifter loading arm, with one at each end of the container. This makes retrofitting onto existing sidelifters quick and easy with minimal disruption to the work flow. Each load pin used in the CWS™ sidelifter configuration has a Bluetooth transmitter cabled to it and fixed to the loading arm. This Bluetooth transmitter can be battery operated or 24v DC power operated and is attached to the fixing arm by a strong magnetic fixing which makes it easy to install onto any existing equipment. Strainstall provides a dedicated CWS™ app which is compatible with customer’s Android phones. 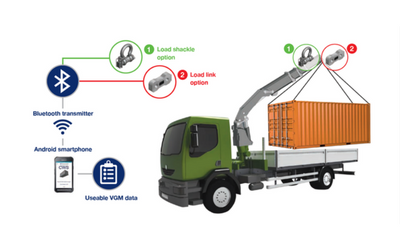 During lifting, the load of a container is displayed and captured on the smartphone which can then be emailed to allow a VGM certificate to be produced, with full traceability of load data. A VGM certificate is a requirement of the updated SOLAS regulations. During the lifting operation, click to capture the container’s VGM and email the date to ensure VGM certificate completion. Strainstall’s Container Weighing System (CWS)™ sidelifter configuration is fully adaptable to suit existing sidelifter manufacturers’ equipment with no modification required, enabling quick and easy installation. The system can be fitted or retrofitted onto the sidelifter loading arm by replacing existing pins and using magnetic fixings for the Bluetooth transmitter which makes installation simple. Strainstall’s CWS™ app can also be used to verify VGM when using a loader crane (or HIAB) with our load shackle or load link. CWS™ for sidelifters allows road hauliers to produce a VGM certificate as a function of standard lifting operations, reducing the cost of having the certificate produced on their behalf and reducing the time associated with using a weighbridge to verify gross mass. The system ensures that all containers are SOLAS compliant.